Spouting near by. Click on the picture to learn more about how spout samples help researchers learn about whales, and how the samples are collected. The surf was still rolling in when we got to work on Tuesday, but it really didn’t seem to affect our early morning Humpback sightings. Guests on our Wake up with the Whales Cruise saw at least a half dozen whales, but we spent most of our time with a trio of Humpbacks who seemed interested in us. These whales circled the boat, surfacing, spouting, and sounding close by. Were the whales really checking us out, or did we just happen to be sharing the same patch of ocean with them? Of course we’ll never really know, but we did give them ample opportunities to swim away, and to us it sure looked like they were choosing to stay with us. On our Mid-Morning Whale Watch Cruise, we watched as a pair of whales were joined by a third Humpback and then a fourth. We figured this would lead to some competition, but if anything, this pod of 4 was just getting to know each other. We also got to spend some time with a pod of Spinner Dolphins who cruised by to give us a look. 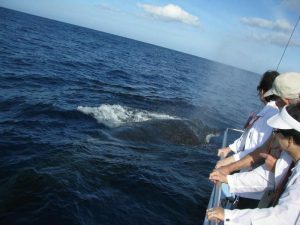 Finally, we operated an Educational Whale Watch Cruise from Kawaihae for the high school students from Laupahoehoe School. We saw spouts from our favorite duo — Mom and calf — early on in this cruise and watched them for pretty much the entire time. Baby was up on the surface a lot, and seemed pretty playful. Mom wasn’t up as often, but she definitely made her presence known to us. Ocean Sports Whale Fact of the Day: When you see the spout from a whale, you’re actually looking at an interesting combination of things. Some of what you’re looking at is condensation from the whales’ lungs (the same thing you’re looking at when you see your own breath after exhaling in a cold environment); some is atomized ocean water (Humpbacks live in a wet world, and there’s always some of the ocean pooled on top of their blow holes when they surface); and…since Humpbacks don’t have cilia in their respiratory tracts (little hairs)…a lot of what you see (and occasionally feel) is actually mucus! And though it may sound kind of yucky, researchers in the last couple of years have been using drones they call “SnotBots” to fly over spouting whales to collect mucus samples. Since mucus contains DNA, hormones and bacteria, the samples can be analyzed to determine the whale’s health, stress levels, and even pregnancies. Click on the photo above to learn more about “SnotBots”.